Web-based property management platform is designed to cater to those who manage properties. It comes with powerful tools that can handle accounting, maintenance, bank records and tenants. The software’s website allows users to publish details related to property, including prices, images and vacancies. It can likewise use Craiglist and other popular real property sites to publish vacancies. Users can share and upload property images, along with leases and other pertinent documents. The solution also has the capability to screen tenants, helping users to determine backgrounds. An automated ACH functionality, on the other hand, aids property groups in making rental payments far simpler by processing them through eChecks or credit cards. It also gives users unlimited access to US support, offering quick resolutions to pressing customer concerns. Rentec Direct offers complete bank, property and tenant accounting for associations, property managers, and owners to manage their records in a simple and accurate way. The software’s general ledger accounting functionality helps you to track income and expenses. Rentec’s property management website allows you to publish your listings online and also track leads. It provides Automated Clearing House (ACH) payments that facilitate​ associations to automate their collections. Plus, you can access unlimited free customer support through phone, live chat, and email. Rentec Direct ranks high in customer satisfaction and its clients recommend it to other users as revealed by online certified third-party reviews. The company offers reliable data security as it uses 2-factor authentication to ensure your data remains safe. 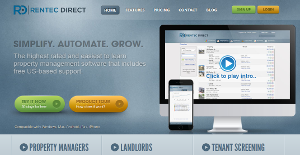 Rentec Direct’s property management platform is easy to learn. You can be up and running in minutes with this quick to learn, yet robust solution. Rentec is focused on organic growth. It is a debt-free, profitable organization so you can rely on its property management software for a long time. Download and sync financial transactions between Rentec Direct and your bank. Synchronize all your financial data with QuickBooks Sync. There are unlimited recurring expenses and fully automated management fees. On top of that, you can use Ratio Utility Billing (RUBS) for managing common area maintenance expenses. Plus, your data is secured using bank-grade security which is the toughest in the industry. Finally, you can join a large community of property managers as Rentec Direct’s software is used by more than 13,000 property management clients. If you are interested in Rentec Direct it might also be a good idea to examine other subcategories of Best Property Management Software collected in our database of B2B software reviews. It's essential to note that virtually no app in the Property Management Software category is going to be an ideal solution that can fulfill all the requirements of various business types, sizes and industries. It may be a good idea to read a few Rentec Direct reviews first as certain solutions can perform well just in a very small set of applications or be designed with a very specific industry in mind. Others can work with an intention of being easy and intuitive and therefore lack advanced functions needed by more experienced users. You can also find apps that support a large group of customers and provide a powerful feature toolbox, but that frequently comes at a more significant cost of such a service. Be certain that you're aware of your needs so that you choose a solution that provides exactly the elements you look for. How Much Does Rentec Direct Cost? We realize that when you make a decision to buy Property Management Software it’s important not only to see how experts evaluate it in their reviews, but also to find out if the real people and companies that buy it are actually satisfied with the product. That’s why we’ve created our behavior-based Customer Satisfaction Algorithm™ that gathers customer reviews, comments and Rentec Direct reviews across a wide range of social media sites. The data is then presented in an easy to digest form showing how many people had positive and negative experience with Rentec Direct. With that information at hand you should be equipped to make an informed buying decision that you won’t regret. What are Rentec Direct pricing details? What integrations are available for Rentec Direct? If you need more information about Rentec Direct or you simply have a question let us know what you need and we’ll forward your request directly to the vendor.